We’ve covered the logic behind the better vision for transport in Wellington. 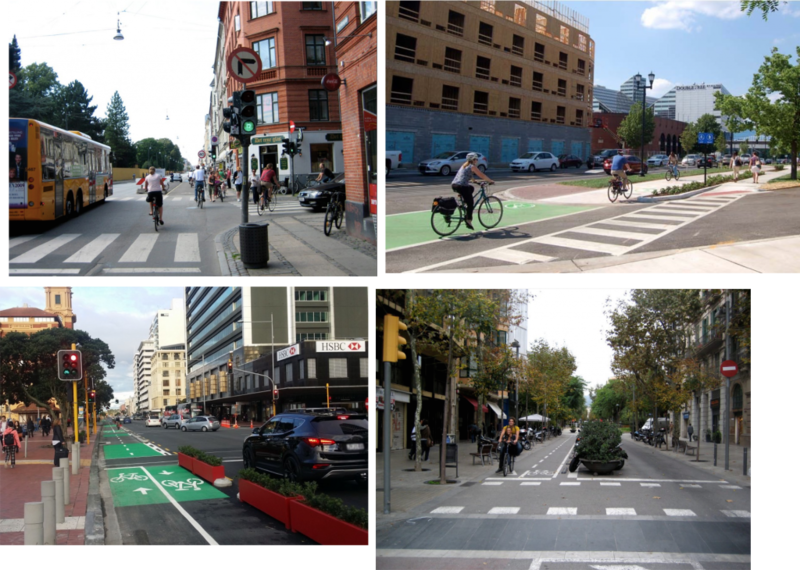 Now in Parts Five and Six of our series, we see first how our city streets would look and feel if they were working properly for us. Note this is the fully illustrated version of the Stuff.co.nz / Dominion Post article . What’s the point of a city? It’s the magic that happens when many people are doing different, vibrant, interesting things in close proximity. Efficient transport is vital, but it’s a means to an end: we move so we can be somewhere. In great cities the moving supports the being, rather than spoiling it. As Wellingtonians, we love the way our city offers so many things to do, so close together. And we have some great public spaces – Civic Square, the Botanic Gardens, the waterfront. But ordinary streets can be great public spaces, too. They can be places for people to linger, socialise, enjoy nature, play games, or just take in the ever-changing panorama of human life that cities present. That’s not generally the case at present. On most city streets, once you’re outside a motor vehicle, you become a second-class citizen in the so-called walkable capital. 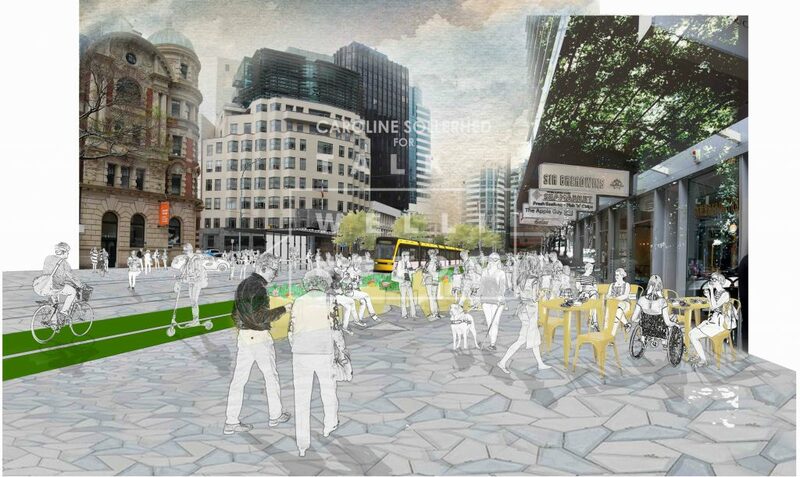 But what would Wellington streets be like if we prioritised people and life on our streets? 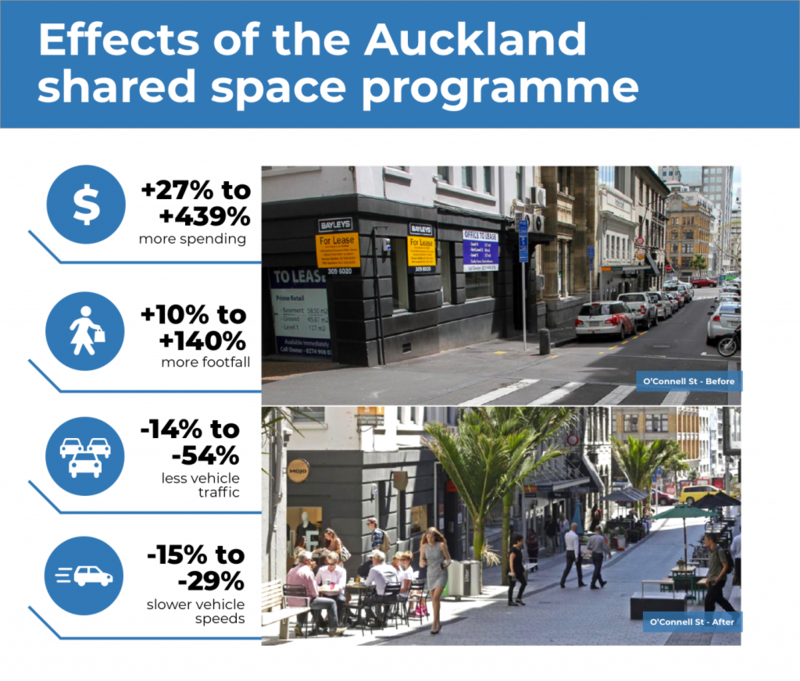 For starters, there would be fewer private cars in the city centre, something Wellingtonians called for strongly in Let’s Get Wellington Moving consultation. 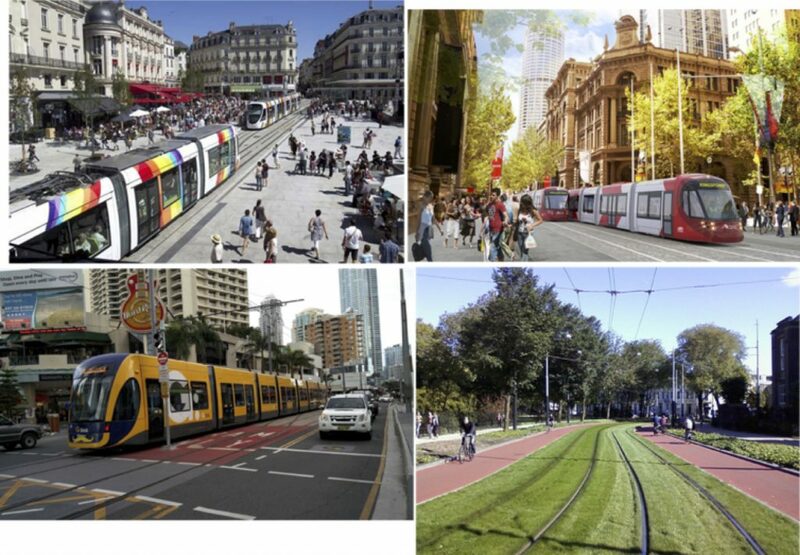 There’d also be a mass transit spine, and more public transport, walking and cycling routes. less traffic noise and better air quality. These cities make use of four basic elements: movement-focused streets, mass transit, shared streets, and people-only spaces. Let’s explore what that might look like in our city. In Talk Wellington’s vision for the capital, a select minority of thoroughfares are movement-focused streets, serving, as their name suggests, primarily to move people and goods around. They have wider footpaths and a 30km speed limit, but still carry more than 5000 motor vehicles a day. (Think of a more attractive version of the Terrace.) Some of these streets have four vehicle lanes, others two. These are the kinds of streets you choose when you want to travel briskly. Mass transit can be any of several options, including light rail, bus rapid transit, and “bus-trains”. But whatever the technological choice, mass transit is the unlocking force for pro-people cities, thanks to its ability to move large numbers of people within a crowded urban centre. Mass transit is special because it can run on everything from completely separated spaces (such as overhead rail lines or underground tunnels) through to busy pedestrian-only plazas. There are several potential routes for a Wellington mass transit service, but they all involve a “forked spine” on movement-focused streets, running between the railway station, city centre, hospital and southern suburbs, eastern suburbs, and potentially the airport. 1. Mass transit vehicles pass regularly and frequently, every 5 to 10 minutes, taking about 30 seconds to pass. 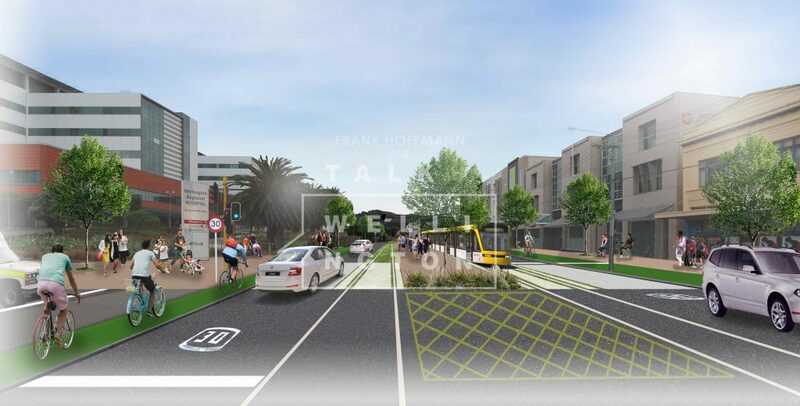 These are some visualisations of the movement street and mass transit elements applied in Wellington. 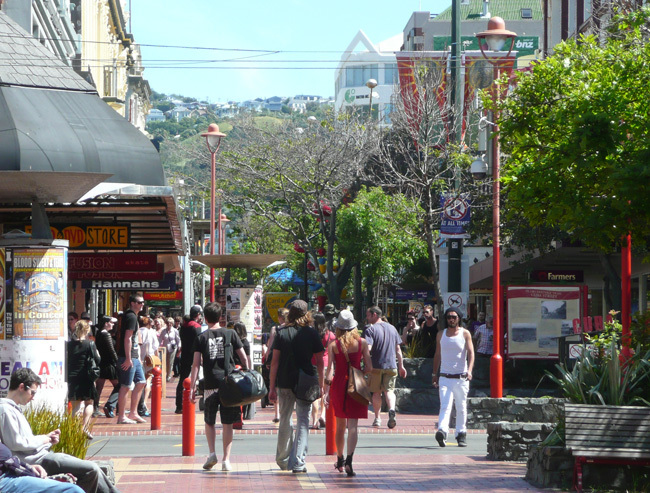 In our vision, the great majority of Wellington’s streets are designed so that people, both moving and lingering, feel like they’re first-class citizens. Here, everyone using the space mingles at a speed that’s pedestrian-friendly – cars, vans, people walking, people on scooters and bikes. At the intersections with movement-focused streets, the vehicles carrying the largest numbers of people – mass transit and buses – get priority. 3. Relatively little traffic – fewer than 2500 vehicles a day (think Brandon St, Ballance St). On top of all this, there would be more places that, like Cuba Mall and Civic Square, are pedestrian-only and ideal for public gatherings, live performance, and events. 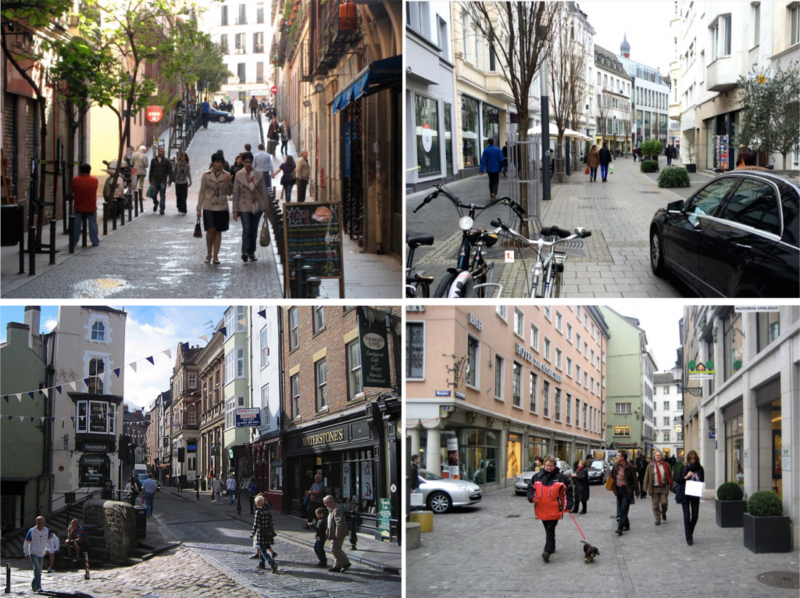 These new kinds of streets are good for business – because they’re good for people. 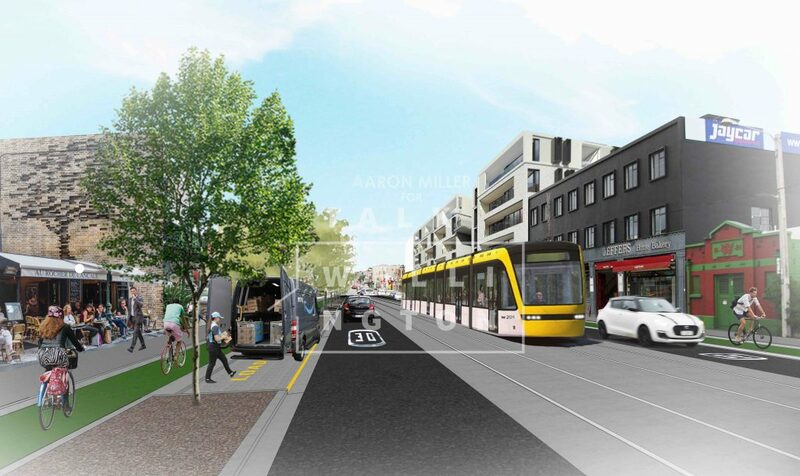 Much as Wellingtonians might hate to admit it of our rival, Auckland’s transformation of its inner-city streets is working well, as the images below show. It’s also proving that it’s a focus on people, not cars and carparks, that make town centres vibrant and generate business for retailers. What will be the upshot of all these changes? There’ll be less on-street parking. In some places it’ll be slower to drive through – though better overall, thanks to more people taking other methods of transport. And it’ll be much easier to move around by walking, scooting or cycling, and by public transport. In addition, streets will be nicer to be in, more commercially vibrant, and more conducive to all the different activities people want to do. Whether you want to walk and talk and shop, or sit and talk, or simply pause and enjoy life in our city, you’ll find that intelligent transport and unashamedly people-centric streets will let Wellington blossom like never before. In the second part of this Saturday’s edition and the final in our series, we’ll see how these street types should be combined into a Wellington street network that’ll let our city flourish, and give people real transport choices. Madrid shared street – Michael Kodransky, EURIST e.V. Friedrichstrasse, Bonn – Michael Kodransky, EURIST e.V. Zurich – Michael Kodranksy EURIST e.V.